The Refined Geek » Introducing a Next Generation PaaS. Introducing a Next Generation PaaS. Gone are the days when large capital outlays are required in order to use enterprise class services. Today any business can get reliable services at a fraction of the cost thanks to the rampant cloudification of anything that dares to touch the Internet. Indeed should you have a need to rent something by the hour you’re usually only a couple clicks and a Craigslist ad away from having it at your doorstep. Curiously though one market has been drastically under serviced, ostensibly because no one thought it was appropriate to combine the cloud computing ideas with the livestock industry. 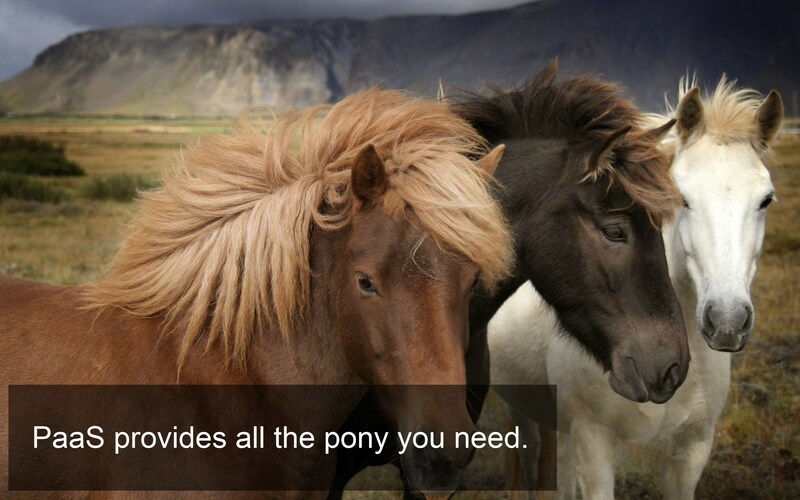 Today I want to introduce you to the idea of Ponies as a Service (PaaS for short). Essentially it’s the commoditization of the already lucrative pony industry which has suffered from a severe lack of definitive platform with which to peddle their wares. Instead of being a traditional pony cloud, whereby there’s a large capital expenditure required to reach critical pony mass, PaaS will instead leverage off already established pony providers (called Pony Partners) which will allow them to monetize otherwise idle pony resources. This, combined with all the features you’ve come to expect from various cloud solutions, will allow consumers to have a highly reliable, robust and scalable pony experience that can be used across any platform. “Ah” I hear you ask “but how can you deliver the pony resources in a timely manner?”. That’s a great question and whilst I can’t reveal the exact specifics since it’s a patent pending technology rest assured that our Orbital Pony Cannon is highly reliable, incredibly safe and ensures that 99.9% of your pony is deployed within seconds of you clicking the deploy button. Of course in the unlikely event of a disaster we will employ our Multiple Launch System which ensures that any availability zone that’s experiencing issues will soon be shortly rectified with an Orbital Pony Bombardment. We’re still in stealth mode for most of this so hopefully our fellow pony lovers will be able to wait until we launch into a private beta. If you’re interested in becoming a beta tester, Pony Partner or Pony Cannon Technician please feel free to email me at [email protected]. I’m really excited to be bringing this service to you guys and I really think this has a chance of becoming something big. I’ll be sure to bring you all the inside updates too so make sure to subscribe to my pony Tumblr, MySpace and Vimeo accounts for more info.